Wouldn’t you rather learn while you lather? Wash away the boring shower blues with the Periodic Table Shower Curtain! Jog those brain cells with some steaming hot water and a giant six-foot tall periodic table! Looking every bit like the poster from your 3rd period Chemistry lesson, this vinyl shower curtain adds a colourful touch of class to the bathroom. Why waste time mindlessly staring at white tile when you could be refreshing your memory on the atomic number of Rhodium? It’s a fun way to help kids study or a clever decoration for science fans! 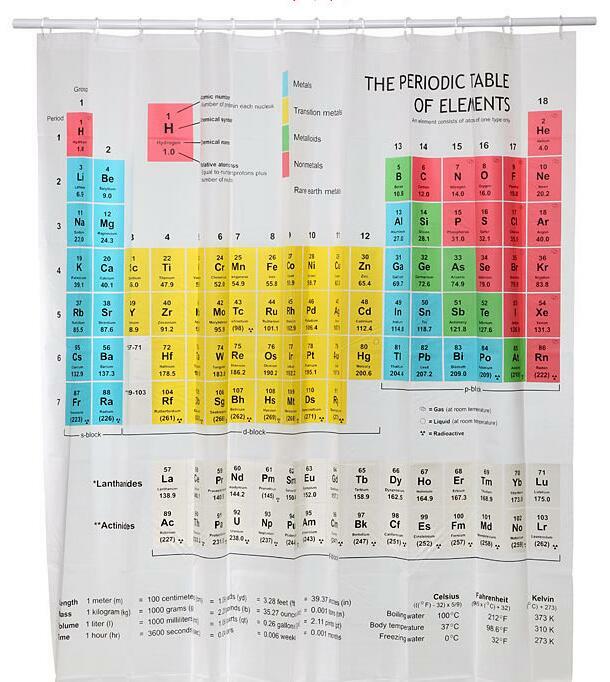 The Periodic Table Shower Curtain contains all the elements up to #111, Roentgenium. Each element includes its symbol, atomic number, atomic mass, and name printed in large letters for easy readability. Measuring at 1.8m², this waterproof, semi-transparent curtain is the ideal companion to the shower’s blast of H2O.